Using locally grown produce in our restaurants is a great way to bring the most flavorful food to our tables and to support sustainable agriculture within our communities. With the help of the Carolina Farm Stewardship Association, we’ll continue development on a model for getting fresh food from the farm to the table. We are thrilled that our efforts are already making an impact. 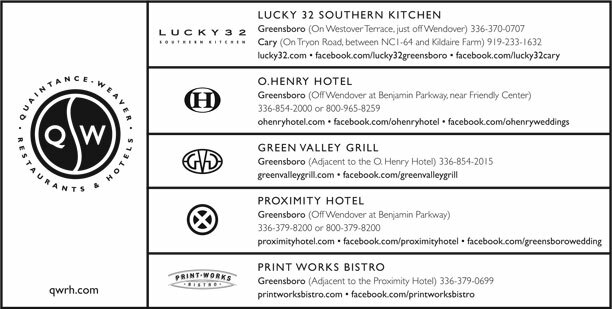 Lucky 32’s July Farmers Market menu brought our initial plans to life. The outcome was so successful that we’ve been getting calls from farmers who want to know what they should plant for the fall harvest. With a bountiful harvest we’ll see another farm-based seasonal menu this autumn at Lucky 32. After a season of serving sweet onions, summer squash and tomatoes that taste like tomatoes, we can’t wait to begin sampling the pumpkins, peas and beans that will be so plentiful in just a few short weeks. Also, UNCG Anthropology Professor Susan Andreatta is heading up a new organization called Project Greenleaf: Rural Prosperity – Niche Farming in North Carolina, which is funded by UNCG and exists to help small farmers find and develop direct marketing opportunities, including farmers markets and restaurants. Dr. Andreatta told us, “Project Greenleaf’s goal is to encourage support for a local food system where consumers and chefs buy directly from farmers. We’ve been able to use some of Lucky 32’s experiences with their partner farmers to develop our plans.” We couldn’t be more pleased and look forward to collaborating with Dr. Andreatta and Project Greenleaf. For more information about Project Greenleaf call 336-256-0439. Austin, TX -As a birthday gift last week, my family and friends treated me to a plane ticket to Greensboro, NC, so I could attend a Southern Foodways Alliance field trip investigating the foods of the Carolina Piedmont. The Southern Foodways Alliance (www.southernfoodways.com) is a University of Mississippi-based organization founded to research, celebrate, and preserve the foodways of the American South. They hold a symposium every October in Oxford, Miss., and this additional North Carolina event was the first in a series of regional field trips designed to acquaint members with the South’s many distinctive regional cuisines. The Piedmont Party was the brainchild of SFA board member and Louisville, Kentucky, food writer Ronni Lundy and Greensboro hotelier extraordinaire Nancy King Quaintance, [co]owner of the O. Henry Hotel where the event was held. These dynamic women delivered a sumptuous four-day banquet, satisfying to all our senses. They established a standard that should be challenging to match. Simply recounting the agenda doesn’t even begin to do the event justice but retelling the high points can give you some idea of the bounty we encountered. Thursday night and Friday morning, we sampled the many Low Country dishes of Charleston chef/restaurateur Louis Osteen and culinary historian “Hoppin John” Martin Taylor (Hoppin’ John’s Lowcountry Cooking). Saturday morning found many of us among the early birds at the city-sponsored Greensboro Farmer’s Curb Market (501 Yanceyville Street, Greensboro, 336/373-2402). Returning to the hotel, we heard hilarious tales from the peach stand of South Carolina novelist and peach farmer Dori Sanders(Clover, Her Own Place), laughing as the juice from her luscious peaches dripped down our chins. Much of Saturday was spent on tour buses, roving the rural North Carolina foothills, visiting herb farms, grist mills, goat dairies, organic farms, and historical sites. We were delivered back to the hotel just in time for a party featuring boiled peanuts and craft-brewed beer. That party finished shortly before a five-course dinner prepared and presented by the top chefs and restaurants of the Piedmont. Sunday morning brought gospel music and righteous testimony about the many talented individuals who preserve and influence the cuisine of that region, topped off by a glorious brunch inspired by the recipes of legendary North Carolina chef Bill Neal. We feasted on cornbread, hot biscuits with shaved country ham, Silver Queen corn, heirloom tomatoes of every color, stone-ground grits, baby lima beans, black-eyed peas, sweet onions, seafood, butter beans, sweet potato rolls, blackberry cobbler, lemon chess pie, peach cobbler, and banana pudding — the freshest and best seasonal foods available to the chefs preparing the meals. Scanning Our State: North Carolina magazine one evening, I noticed a quote from our hostess, Nancy King Quaintance, that explained everything about the meals she and Bart Ortiz, the hotel’s vice-president of flavor and consistency (don’t you just love that job title? ), served while we were guests at the O. Henry. She was quoted as saying, “I’ve long believed that the nearer the farm to the fork, the better the flavor. Supporting local markets is a way to see that the best foods get from the farm to the table in our restaurants and homes. Talk about a wonderful example of enlightened self-interest: We can help our communities by buying food that tastes better.” This is certainly a woman after my own heart!